Best rendering of one I’ve seen yet. See, this kind of thing just makes me wish Guillermo del Toro was making “At the Mountains of Madness” next, instead of spending four years with Hobbits. Is there more of that? It’s an interesting experiment. I’ve always found Lovecraft and Tolkein very similar in style, which means that sort of works. It’s spooky. What this movie need is TOM CRUISE! 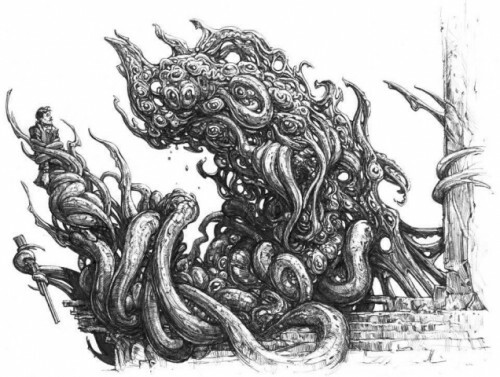 Flashing his pearly whites as he unloads his gun into an advancing Shoggoth’s eye(eyes?) and giving a cheeky wink as the movie concludes with a HAPPY ENDING! …excuse me while I puke.